The Underpainting, why even bother? * Latest studio blog and Instagram! * Christmas sales about done. 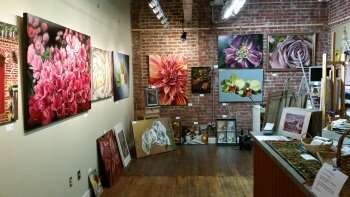 After opening my studio last month, I was peppered with questions from visitors about my process. 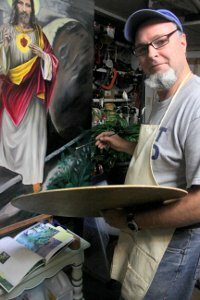 Now, as most know, I love talking about how I paint, and this particular subject came up in several of the conversations. Why bother with all this under-painting stuff when you are just gonna cover it up any way. I then showed them some small works done in a more direct painting method, and those using the underpaintings. Most would agree, the 7 layered paintings had more depth, a richer tone in the shadows, and seemed to have more presence. Several folks commenting on how vibrant the colors were, and how did that happen. Again, I pointed to the under-layers as the secret. 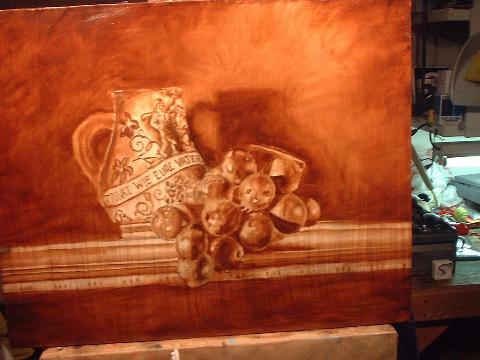 Learn more here:The Brown or Umber Underpainting. Latest studio blog and Instagram! We southerners can get nuts when snow is in the forecast. Why? Well, we don't see it as often as in older times. Yea, I know, you're tired of hearing your elders say, "when I was young, I walked five miles through that stuff to get to school!" Problem is, it was truth. I'm just thankful I live in a time and place where this is an issue. And not from the lack of clean water, or bullets flying through our walls because the local militia is fighting some obscure drug cartel or religious jihads with rags on their heads because they think their religion is the only thing the world must follow. For me, it's just a bit of downtime and catch up on emails, blogs and newsletters that need to be done. So with that, here's whats been happening at my studio. A short film reflecting on 2015, for my customers! 2015 thank-you video I would ask this of you. With each of my paintings, there is a little story behind it. The reason or the circumstance that went into it's creation. If you take the time to read these short stories, you will invariably get a glimpse into the life and times of a baby boomer coming of age, and with his faith, the loves of his life, and his continued love of his craft, perhaps glean some of the wisdom and enjoy a bit of his wit as he paints his life around him. Wow, maybe I should add that last statement to my bio!